Credit union officials, business partners, and representatives from UC Davis Children’s Hospital and UCSF Benioff Children's Hospital Oakland, and the Sacramento Running Association at the 2018 Credit Union SacTown Run. This year’s event raised more than $235,000 for Children’s Miracle Network Hospitals in California and Nevada. 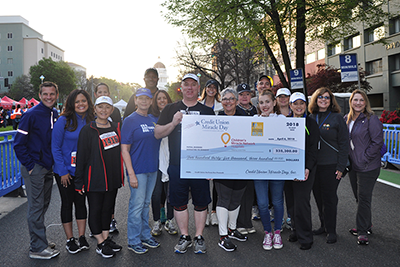 The Eighth Annual Credit Union SacTown Run—which took place in Sacramento, CA on Sunday, April 8—raised more than $235,000 for local Children’s Miracle Network Hospitals in California and Nevada. More than 2,000 runners participated in the SacTown Run—nearly half of them credit union employees and members. The event, which starts and ends at the California state capitol, features a 10-mile race, the UC Davis Children’s Hospital Miracle Mile fun run and fitness walk, a 5K, and the “Homemade-Half Challenge” (for those interested in running the equivalent of a half-marathon). The event is hosted by the Sacramento Running Association and also serves as the Pacific Association 10-Mile Championship. Click here to view photos from this year's event! “We’re excited to celebrate our seventh anniversary with the Sacramento Running Association in hosting such a wonderful and meaningful event. Thanks to credit unions and businesses in California and Nevada, together we have raised more than $1.5 million over the past seven years to benefit Children’s Miracle Network Hospitals throughout both states,” said Diana Dykstra, president and CEO of the California and Nevada Credit Union Leagues. At the event, the top male runner was Sid Vaughn of Colorado with a time of 47:46. The top female runner was, for at least the third consecutive year, Jane Kibii of Auburn with a time of 55:22. Angela House, a former patient from UC Davis Children’s Hospital, once again sang the national anthem—her third time in as many years doing the honors. Also participating at the event was Mark Payne. He along with seven members of his family ran the 5K proudly wearing their Team Brooklyn t-shirts in honor of his first child who was born prematurely. Last July, on the same day Mark Payne started his first day of work, his wife Melanie started having contractions. She wasn’t due until Oct. 27. Their daughter Brooklyn was born on July 18 at only 25 weeks, weighing 1 pound, 4 ounces. Things looked dire. At two months old, Brooklyn has her first surgery—a Patent Ductus Arteriosus (PDA) ligation to close a hole in her heart. Two eye surgeries followed. The Payne’s spent months in the Neonatal Intensive Care Unit (NICU) at UC Davis Children’s Hospital. Today, Brooklyn is 13 pounds, grabbing and giggling; scooting and smiling. She is developmentally on track. “But what a wonderful place to be, and with all the resources that UC Davis has we feel so blessed, we have our beautiful daughter to show for it,” added Melanie Payne. Major sponsors of this year’s event were California and Nevada Credit Union Leagues, CO-OP Financial Services, CU Direct, Golden 1 CU, Greater Nevada CU, First Tech FCU, Patelco CU, SchoolsFirst FCU, Travis CU, Wescom CU, and Walmart. Credit union sponsors for this year's event included: Antioch Community FCU, Boulder Dam CU, CalCom CU, Cal Poly FCU, California CU, Caltech Employees FCU, Clark County CU, CoastHills CU, Credit Union of Southern California, Delta Schools FCU, Desert Valleys FCU, Diablo Valley FCU, Eagle Community CU, Elko FCU, Financial Horizons CU, Great Basin FCU, Heritage Community CU, Inland Valley FCU, Kaiperm Diablo FCU, KeyPoint CU, Kinecta FCU, LBS Financial CU, Nikkei CU, Operating Engineers Local 3 FCU, Orange County’s CU, Pacific Marine CU, Pacific Service CU, PostCity Financial CU, Premier America CU, Provident CU, Redwood CU, Sacramento CU, San Diego County CU, San Mateo CU, Schools Financial CU, Sequoia FCU, Sierra Central CU, Siskiyou Central CU, SkyOne FCU, Technicolor FCU, United Catholics FCU, UNCLE CU, Upward CU, USC CU, VA Desert Pacific FCU, Western Healthcare FCU, and Xceed Financial CU. Major business partner sponsors include: CUNA Mutual Group, Credit Union Direct, Catalyst Corporate FCU, California Members Title, Inspired Staffing Integrated Builders Group, InterWest Insurance Services, Kasasa, Lucca’s Restaurant, TrueEdge Builds, QwickRate, CO-OP Miracle Match, and VISA. This year's SacTown Run received major media coverage, including from ABC10's Sac & Co, KCRA TV, and Good Day Sacramento on CBS.